A screenshot of the time-lapse video showing two bands of plasma shooting away from the sun. A sun-watching spacecraft spotted our closest star opening its arms to the cosmos. Two strands of plasma from an eruption in the sun's atmosphere were captured in observations with NASA's STEREO A satellite. The plasma arms broke out from a sunspot in a 12-hour-long event that occurred from July 21 and 22, according to NASA. 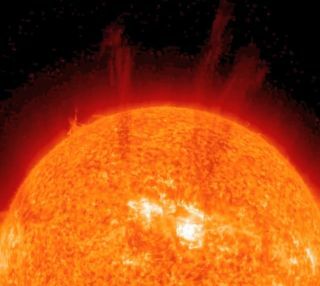 The solar phenomenon was observed in a wavelength of extreme UV light and condensed into a time-lapse video of the sun storm. STEREO A and its sister spacecraft STEREO B launched in 2006 as part of NASA's Solar Terrestrial Relations Observatory. They are just two of the space agency's satellites tasked with monitoring the sun's activity. NASA and the European Space Agency also oversee the long-lived Solar and Heliospheric Observatory, or SOHO, which launched in 1996 and recently spotted a gigantic hole in the sun's atmosphere covering nearly a quarter of the solar surface over the sun's north pole. NASA's powerful Solar Dynamics Observatory and other probes also keep constant watch on the sun and its space weather impacts. The sun is currently reaching its 11-year peak in activity, known as the solar maximum. During this period, there are more sunspots causing a boost in solar flares and ejections, though this cycle's peak is shaping up to be the weakest in a century, scientists have said.